In April, 2010, Robert Birkett and his family were en route from Calgary to Toronto by air. Two hours before landing, there was a call on the public address system looking for emergency medical assistance to help with a passenger in distress. Robert offered assistance and was taken to a female passenger who was slumped over in her seat. She was wearing an oxygen mask, but was not moving in any way. A check of her vital signs revealed no pulse or respirations. The patient was transferred to the floor of the aircraft and Robert began CPR. Soon after that, he was joined by another passenger trained in emergency medical services, who took over the respirations. A few cycles later, the patient started to cough and breathe. At this point, the woman was verbally responsive, but only to voice, and could not communicate other than by moving her hands. She began to drift in and out of consciousness and respirations did stop, however, a pulse was present. For the next hour or more, Robert continued to monitor her breathing and condition while the patient lay in the aisle of the plane. When the flight landed, the captain advised everyone that they were going to land hard and fast, and to fasten their seatbelts. The flight attendant asked those seated near both rescuers, to hold onto both rescuer’s clothing to provide support during landing. It was later learned that the individual was released from hospital after the incident and she made a complete recovery from her cardiac arrest. Performing CPR can be challenging in any situation. In the confined space of an aircraft, however, with no access to medical assistance, it can be extremely challenging. 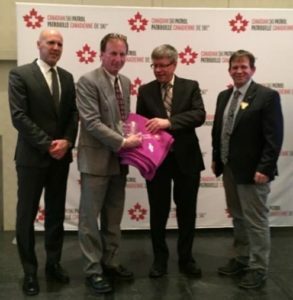 For his quick action and willingness to get involved, the Canadian Ski Patrol was honoured to present Robert Birkett with the John D. Harper Lifesaving Award at the Altitude 2018 conference in Quebec City.